Rawson's Metalmark (Calephelis rawsoni) butterflies are quite small and very easy to overlook, but when seen close-up they are surprisingly beautiful. The dorsal wing surfaces are a deep red-brown with a pattern of dark wavy lines. A row of black spots runs between two sparkling metallic silver lines along the edges of the fringed wings. 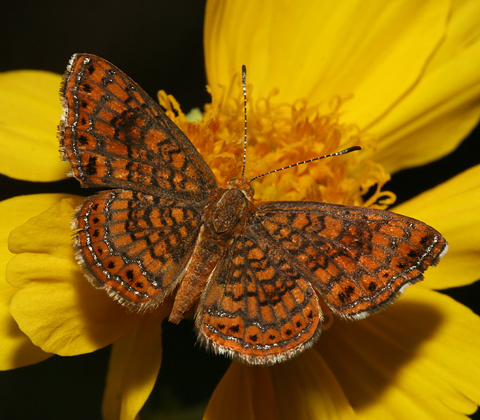 The ventral wing surfaces are similarly marked but are a lighter brownish orange color. Rawson's Metalmarks are found in moist areas, such as along streams and in riparian areas here in Arizona, and they are usually localized throughout their range. I spotted this one in a wet, weedy drainage gulch near the Tanque Verde Wash here in Tucson. A favorite food plant of Rawson's Metalmark caterpillars is the Palmleaf Thoroughwort (Conoclinium greggii), which also happens to be one of the best flowers for attracting many species of adult butterflies as well.